Austin gets hot! You know how our summers are here, miserable, hot and humid. An attic fan ventilates your home by removing the hot air from your attic and putting it back outside where it belongs. In doing so, this allows your AC system to run less because it doesn’t have to compensate for the heat that was invading your home and making the temperature rise. Provided that your home is also insulated adequately with fiberglass insulation and even with radiant barrier, you will enjoy lower energy bills monthly because you are not running your AC as much to keep your home comfortable. Attic fans work with your entire insulation system in your attic. The colder your attic, the less your AC runs daily, and the lower your monthly electric bill will be as a result of it. 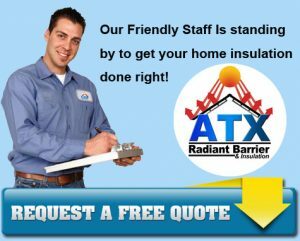 The industry-leading experts at ATX Radiant Barrier & Insulation offer the installation of the best solar attic fans made today. With our solar fan in your home, you will have improved air flow. Benefits of Installing Our Solar Attic Fan! Solar attic fans are a simple and environmentally sensible solution that will save you money. Solar powered attic fans run entirely on solar energy, this sleek and efficient vent is both compact and quiet. The solar attic fan is operational right from the box, it installs easily, with no electrical wiring, and without an expensive electrician and city permits. And let’s not forget powerful! The solar attic fan operates at a whopping 850 cfm, a single unit can fully vent up to 1200 square feet. Place the solar attic fan wherever you need improved circulation; attics, garages, lofts, workshops, storage sheds, and even barns. Increases The Lifetime of Your Roof! The solar attic fan is placed near the peak of the roof to draw hot air out of the attic. Just as in a car in the sun with the windows all closed, the air in an attic can reach 150F in the summer. This makes the air conditioner work harder because it has to fight against the heat from above. The attic fan pulls the hot air out of the attic, drawing outside air in through vents, cooling the attic, and reducing the need for air conditioning. Since the temperature had recently been in the 90s, this was on our minds. A hot attic will fill your insulation with heat causing excessive heat transfer from your attic to your living space. By reducing this heat, you will improve the efficiency and comfort of your home. Minimizes backpressure of exhaust gas. Natural Light incorporates an angled throat within the flashing that provides a venturi effect, which increases airflow. Natural Light was designed from the ground up to minimize obstructions in the flashing and shroud. Maximizes sun exposure to solar panel. Natural Light designed a mounting bracket that houses the solar panel that allows for angling the panel. The mounting bracket allows for remote mounting of the solar panel that provides for optimal panel/flashing replacement. Minimizes ambient temperature of a solar panel since power output quickly decreases as temperature increases. Natural Light powder coats the entire solar attic fan assembly in a neutral gray color thus ensuring that it does not act like a heat sink. The solar panel mounting bracket allows for an envelope of cooling air to continually circulate the entire solar panel. Adaptable to any location or roof type, in any environment. Natural Light solar attic fan is constructed of .080 (14gauge) aluminum, the flashing and shroud are seamless ensuring weather tight installations. Thanks to the industry’s leading manufacturers of solar panels (BP), low voltage DC motors and the use of high quality materials and precise construction techniques employed by Natural Light, the solar attic fan is covered by an industry leading 25 Year Warranty on the housing, 10 years on the panel and 5 years on the motor. Let’s face it, as far as green energy goes, and the products included wind and solar are at the top of the list. With a solar attic fan, the guesswork is removed because the system charges itself by using the Sun’s rays to power the unit and when it senses that your attic is getting too hot, the fan initiates and pulls that hot air out of your home and back outside where it belongs. Solar energy has been around for many years, but only in the last decade have there been technological advances that can now be enjoyed efficiently by consumers and businesses alike which can aid in energy conservation and reduce the carbon footprint on the planet. Like most things, no two solar attic fans are created the same. At ATX Radiant Barrier & Insulation, we take pride in using only the best solar attic fans. Our fans are manufactured right here in Texas. Our solar attic fan was developed, designed, and engineered to offer our customers the best in solar ventilation. No matter the space being ventilated, we offer the best solution for solar powered attic ventilation. 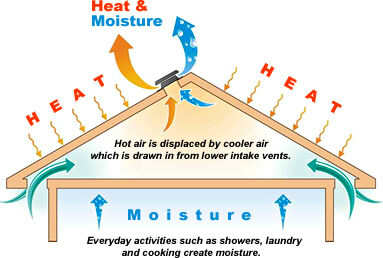 ATX Radiant Barrier & Insulation’s solar attic fans not only have an adjustable panel and an 85 degree on – 70 degrees off the thermostat, but it also offers a humidity sensor which will turn the fan on when humidity is over 75% and turn it off when humidity drops to 60% keeping the attic dry. Call us today to find out more about Austin’s high-performance solar attic fans.